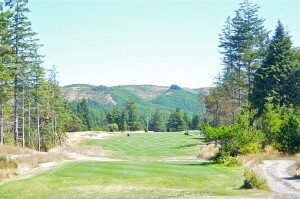 No doubt you have heard of the four outstanding golf courses at Bandon Dunes in Bandon, Oregon. Well, there is yet another, the Bandon Crossings Golf Club. It is a most welcome addition as it is both a fraction of the cost and provides riding carts for those foot-weary Bandon Dunes players who want to rest and yet get in another round of golf. Better yet, it’s a terrific golf course! Bandon Crossings is not associated in any way with Bandon Dunes, but it very definitely should be included in any trip there. Where the three current Bandon Dunes courses represent three of the best modern American courses with all being Top 100 caliber, they are also becoming a bit pricey – $250 per round not including a caddy. For a top rate of $70 plus a cart fee, Bandon Crossings is a very, very good alternative. What’s more, Bandon Crossings does provide riding carts for those foot-weary patrons at walking-only Bandon Dunes. Portland architect and PGA club professional, Dan Hixson, crafted the layout that sits about five miles south of Bandon directly on Highway 101, an easy twelve minutes or so south of Bandon Dunes. Inspired by Alister Mackenzie and an admirer of Bandon Dunes Founder Mike Keiser’s push for sparking the naturalist-minimalist architectural movement, this was Hixon’s first course to open. Accordingly, he poured his heart and soul into Bandon Crossings, spending more than two hundred days on site. You will find Bandon Crossings an interesting mix of heathland and parkland golf. Tall golden grasses wave in the breeze on the borders of the wide fairways and the greens are attractively guarded by wispy bunkers, much as Coore and Crenshaw or Doak might fashion. The building efforts were also aided by the local construction crew headed by Tony Russell who had also helped to build the three Bandon Dunes courses. The result is a look and feel not out of keeping with the general theme of the Bandon Dunes courses. The site is situated on an ample 340-acre parcel a mile inland from the Pacific Ocean. Built upon former sand dunes, the property easily traverses the rolling hills, picturesque wetlands and creeks, and stands of coastal fir, pine, and madrone trees. Though it has a coastal feel to it, Bandon Crossings receives much less of the cold fog. In analyzing the holes, there is not a bad one out there, though the first four holes traverse the most mundane land on the property. The stretch between the 5th and 13th is quite stirring as is the par-5 finisher. And before I realized it, I was about to write that I enjoyed the par-fives, the threes, and the fours. Hmmm, that about says it all. This is not anywhere close to a “throw away” course on your Bandon trip, but definitely one to include toward the middle or end. Certainly Bandon Dunes remains the main draw to attract golfers. Typically, visitors will enthusiastically play 36-holes a day there. By the end of the second day, most are sore and exhausted. Well, now there is a convenient, even more affordable riding golfing alternative that is far more than just another average local golf course. Bandon Crossings is really very good. With its value proposition and riding option, you might even find yourself playing a second round there. Tell them that Bob Fagan sent you! Fagan Rating – B+. Located anywhere else, this golf course would attract even more attention. Suffice it to say, Bandon Crossings is an exceptional golf experience at a very good value. Value or not, Bandon Crossings quite stands on its own as a rather exceptional golf course and should not be omitted from any trip to Bandon, Oregon. Can I just say what a relief to discover somebody who actually knows what theyre talking about to the internet. You definitely know how to provide an concern to light and allow it to be vital. More people have to read this and recognize this side in the story. I cant believe youre not far more popular since you undoubtedly have the reward.